Jennifer Lopez set the internet ablaze before the year ended with pics of her getting cozy with Drake. However on Wednesday(December 28th) she was spotted shopping solo out in Beverly Hills. 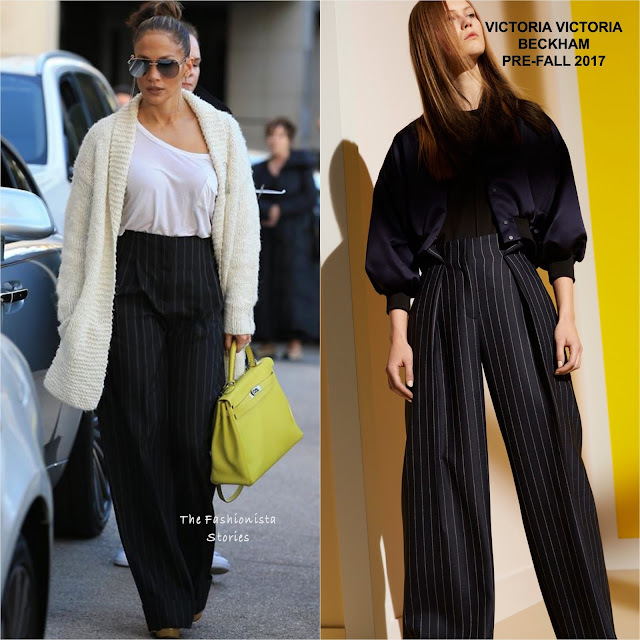 The singer/actress stepped out in a white cardigan, a white tee and on trend VICTORIA VICTORIA BECKHAM PRE-FALL 2016 navy pinstripe wide-leg trousers which we also saw on the designer. JLo kept her ensemble interesting with a yellow HERMES tote. I can get pass the fit of the tee because I like this casual look for shopping. It makes a subtle chic statement. Aviator sunglasses, a top knot and CHARLOTTE OLYMPIA heels finished up her look. Happy New Year to you as well Christine & thank you!